I was just watching your little chicks taking turns chirping. This is rocket science to me, so please forgive my ignorance in advance. Is it possible to make the robin in the birdhouse chirp, too, or is that adding too many layers (is that what you even call it, layers? I am not trying to mess with your signature line, I am just wondering as I am enjoying the little chicks. Like I said, all the movement stuff is over my head, it was just a wandering thought as I sit here watching your chicks as I can finally relax, home from the prom. Thanks, Brandi, I enjoy your work and see that it must take a great deal of time. (As I am typing this, a robin started chirping out of nowhere (it is 12:38 am here). How cool is that? Glad you got some time to relax! I think the robin chirping was an Omen. I have found that just about everything is possible with graphics, if one has the skills, software and time to devote to it. In order to do what you asked, this is what I had to do. I am hoping that is what you meant. Sometimes I have a teeny problem understanding what people want. That's amazing, Brandi and I am so impressed that you did it to show me. Thank you. I just wasn't sure how many things could go on at the same time. Once again, I am amazed. One avatar I made for Northern Rose for Halloween, I believe had 13 or 14 different animations in it! So, there really is no limit. Maybe you want to see if you can spot them? Anyway, always feel free to ask me anything about animation/graphics. Hi Brandi.This is my little Baxter in my avi.Do you need the orginal file or can you just use my avi? 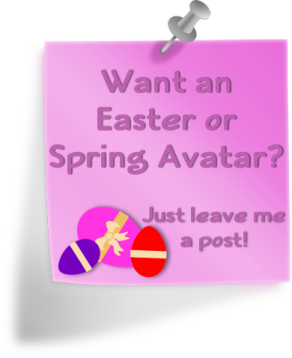 I'll make you an Easter design when I get it. Sent you the picture.Looking forward to your artwork.I can tell you he is ornery and loves to play.He acts like a little boy in his terrible twos.Thanks. I'll post some Easter designs for you on Monday. Of course I had to see if I could spot them. How many graphics are on her hat? Depends on how you count them. The monkey's cap has 4, the scientist's hat has 5 lights. Each requires its own frame. The chandelier has 4 separate candles, each had to be animated separately. The monkey and the scientist are both blinking. Some days I have a lot of trouble getting my design mojo. Last night and today were two of those days. Hard to see where he begins and he ends. If you have any other pictures of Baxter you can send them to me via email for future avatars. Otherwise, I can reuse the one you sent. I just want to do him justice! Thanks Brandi I love them all.It was so hard to choose.I will see what other pictures i can come up with. Thanks Brandi I love them all. It was so hard to choose. I will see what other pictures i can come up with. No rush on finding another picture, but if you have some handy you would like me to try to use, send 'em my way! Amazing. What about the eyes, do you have to make them blink separately? That must be a pain. I thought I found them all, that is why I was asking if you counted the hat as 1 or 5. What about the windows, do you light them up, too? Yes, each blinking eye must be made to blink separately. They are relatively easy to do. Getting the blinking timing can be tricky though. The windows in these do not light up, but if one wanted them to, yes, it would be another animation. In the third avatar, there are some green eyes outside the window blinking. That needed quite a few frames to accomplish. Some Springtime extras for you. First one is a little "artsy-fartsy"
OOpsy. Posted in wrong thread. Knew that would happen eventually. I love the avis.I still have the one of Digger,and I am gonna use it this summer. I had forgotten all about that digger one. love looking at your art work brandi...so talented! Good to see you here, cookie! Page created in 10.19 seconds with 19 queries.